In 1977, NASA launched the space probes Voyager 1 and Voyager 2 to explore Jupiter, Saturn, Uranus, and Neptune. This book tells of what was known about those planets and their moons before the Voyager missions, as well as what Voyager discovered about those planets and their moons. This book is written for the middle-grade reader, and can be enjoyed by readers age 12 and up. Verba's account is crammed with information about the moons, rings, atmospheres, temperatures, and orbits of these planets . . . the large quantity of information makes this a worthwhile resource. . . .
Joan Marie Verba has written a wonderful tale of the craft that have gone where no one has gone before. . . . Geared toward the intermediate student, the books is well written . . . and brimful of information. NASA launched Voyager 1 and 2 in 1977. These flights of exploration greatly expanded our knowledge of the outer planets of the solar system. Verba gives a concise but fairly thorough description of the Voyager project from conception through the completion of the probes' photographic mission. 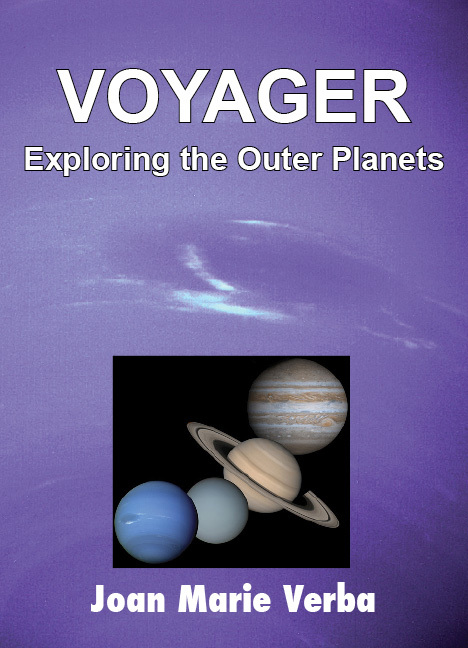 Voyager begins with a brief discussion of the exploration of the solar system prior to the project. . . . Each of the chapters on the outer planets begins by describing what was known before Voyager, followed by what new things we learned as a result of Voyager. . . . The material is appropriate for interested 5th and 6th graders, but the vocabulary level is more at the 7th- and 8th-grade level ... this is a good account of the flights of Voyager 1 and 2 and what we learned from them. Before the Internet, before PCs and MACs became common household items, at the dawn of the era of VCRs, Star Trek fans were making history. In Boldly Writing, Joan Marie Verba chronicles the development of Star Trek fanfiction, Star Trek conventions (the first Star Trek convention may not be the one you're thinking of), Star Trek clubs, and Star Trek revival efforts. 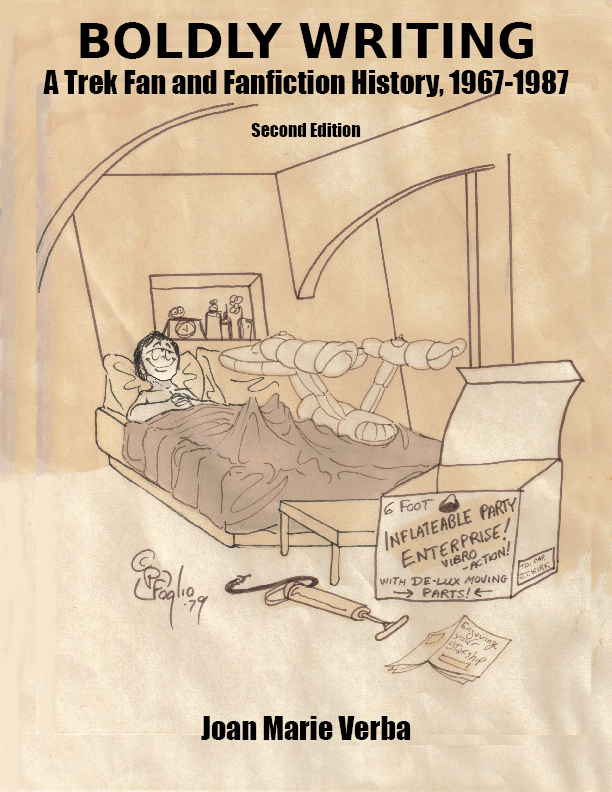 Boldly Writing tells how the term “Mary Sue” came into being, and follows the fan and fanfiction discussions and controversies of the era. At a time when fan communication was conducted largely through the mails, and fanfiction circulated through fanzines printed on spirit duplicators and mimeographs and offset printers, Star Trek fans created a lively and active fandom that continues today. When Star Trek began in 1966, it instantly captured the attention of science fiction fans, and gained an attentive audience. When NBC threatened to cancel the show after the second season, the fans wrote in, demanding that it be returned to the air. After the third season, Paramount, NBC, and industry experts felt Star Trek was past. But the fans did not. They started clubs, organized conventions, published newsletters, and kept writing to Paramount to ask that Star Trek be revived. Through these actions, they kept interest in the show alive and flourishing. At last, fan efforts resulted in the Star Trek movies, and Star Trek: The Next Generation. Currently, Star Trek lives on in five series—and the adventure continues. Boldly Writing chronicles all of these fan efforts, and recognizes the most valuable resource of Star Trek: its fans. The trends, obstacles, hard work, and success of the revival efforts are detailed through the first 20 years of fan publications. Author Joan Marie Verba has been an active fan since the very beginning of Star Trek, and a zine reader, writer, publisher, and collector since 1969. This book pulls together an incredible amount of information about the history of fandom and does a major service for anyone who either wants to relive those exciting years or to better understand how Star Trek emerged as such a national and international phenomenon. I'll give you a clue. If Star Trek lives, it's because of what early fans like Verba made of it. I strongly recommend this book to anyone interested in fandom (which increasingly means anyone interested in popular culture). 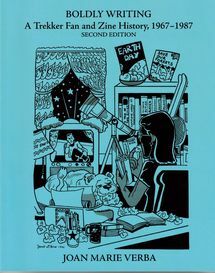 Joan Marie Verba brings back to life the heady days of Star Trek fandom, chronicling the fight to revive the original series and detailing the controversy and the gossip that fueled the first twenty years and gave birth to generations of wonderful poets and writers. I couldn't stop myself from dipping into this fascinating history. Thank you for your Boldly Writing. I found it most informative, especially in light of where [the] Star Trek fanzine is now. It’s come a long way. Congratulations and continued success. Jacqueline Lichtenberg, co-author of Star Trek Lives! Little did I know on September 8, 1966 that watching a new television show would profoundly change my life. Star Trek has been inextricably woven into my existence ever since. In Boldly Writing, Joan Marie Verba chronicles the height of the fanzine phenomenon.... Joan's book is an amazing reminder of all those stories we shared, those dreams we dreamed, as we went where no fandom had gone before.